BlackBerry today announced that its first (and only, until now) Android smartphone, the Priv, is officially receiving its Android 6.0 Marshmallow update - following a few weeks of beta testing. Owners of unlocked BlackBerry Priv units should be able to get the Marshmallow update over the air starting today, April 26. Folks who bought the handset from AT&T, T-Mobile, or Verizon will have to wait until May 3 (next Tuesday) to receive the update and get rid of Android Lollipop. In addition to all the new features that Marshmallow itself includes, the Priv update brings some BlackBerry-only enhancements: updated BlackBerry keyboard, updated Launcher (the home screen is now easier to customize), more notifications available in BlackBerry Hub, and improved battery life. Furthermore, once you install Marshmallow, you'll also have the May Android security patch on your Priv (BlackBerry prides itself in being the first OEM to release security patches, but, as you can see, it was slow in delivering the Marshmallow update). Originally released in November for $699 unlocked, the BlackBerry Priv is now $50 cheaper, though you can get it for even less if you're buying it from AT&T. I'm sure the internet knew before you. Alot of other Android websites had this same news before Phone Arena. So I doubt they got it from you. Whatever! I send the screenshots of M upgrade for PRIV and after an hour they have this news. Crazy that a phone website would come across the same information as you about a phone. It boggles the mind. It's about time. I don't see N coming to the Priv based on how long it took for Marshmallow so this could Probably be the last major update. Considering the Note 5 just got Marshmallow a couple of days ago, that isn't exactly an indictment of the Priv. Monthly security and bug fixes are more important and the Priv gets those faster than any other non-Nexus device. Yes fair point. The bug fixes and security updates are far more important. You act like you own one or even ever considered buying anything that doesn't have an Apple logo on it's back lol And even with 6.0.1, the Priv will offer more features than what iOS will in atleast the coming 3 years, I am talking software wise. The Priv will be forgotten about in another few months while the iphone will still be relevant. The PRIV won't be forgotten. It's the first of its kind. In that retrospect, it will remain "relevant". You mean like the HTC First? The Fire phone? The Nokia X? The many versions of HTC's devices that were supposed to be the "first of their kind?" 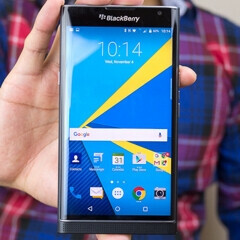 Don't be ridiculous.mNONE of those handsets can even compare to the BlackBerry PRIV. I'm not being ridiculous. They were first of their kind and are completely forgettable. Stop trying to act like no phone can compare to the Priv. You're being completely ridiculous. And those phones don't compare to the PRIV. Stop acting like no phone can compare to the iPhone. Lol, I haven't said anything about the iPhone here. You're making stuff up. And I never said or implied that no phone can compare to the PRIV. You're making stuff up. Lol. Oh you've said it many times before. Lol, are you serious? So you've never said the iPhone doesn't compare to the Priv? Quite recently in an article, I listed several phones that were the first of their kind that ended up being forgettable, and you commented saying they don't compare to the Priv. You're a complete idiot. Me saying that the iPhone doesn't compare to the PRIV isn't me saying "no phone compares to the PRIV". I knew you had a reading comprehension problem, but I had no idea it was this serious. And HTC First, Fire Phone and Nokia X DO NOT equate to every phone. Do you realize just HOW MANY phones there are? You're really reaching now, and it's pathetic. No, you're just deflecting really bad. You know you've said it and if you didn't say it, you damn well implied it. You're more transparent than a ghost. No, you're the one who screams pathetic. No, you're just LYING really bad, as evident by the fact that you can't provide a link proving otherwise. Now you're backtracking saying I "implied it". Lmao! You're nothing but a pathetic, lying troll. Well I'm not the only one who has called you out on it. This is not the only time you lied and backtracked, either. Link the source that says PRIV won't be receiving Android N, or are you just basing this on your assumptions with no facts to back it up? And as already noted, considering that the Note 5 just got Marshmallow, and some Android OEM's have yet to release MM to their 2015 flagships, I'd say you don't have a leg to stand on here. At least the PRIV gets the more important monthly security patches at a pace on par with Nexus devices. And with the additional features the PRIV will get, as also noted, the PRIV puts your iOS toting device to shame as far as features go. Keyword is PROBABLY. I didn't say it was a definite thing. Actually the ios device I use along with my moto x pure puts the Priv to shame. Your iOS device as well as your Moto X putting the PRIV to shame is subjective, at best. I can name things that neither can do that the PRIV can do, especially the iPhone. Feature-wise, my Passport and PRIV puts your two devices to shame, IMO. When your Priv and Passport can be used on any carrier, then I'll care. But I see you changed your tune after I showed you missing a key point in my comment. When the iPhone can do something that dumb phones take for granted, like send files to phones from different OEM's, then I'll care. I see you changed YOUR tune after I challenged you to show a link proving your assumptions and you obviously can't.